The official journal of: The Edward Jenner Society and The Japanese Society for Vaccinology. 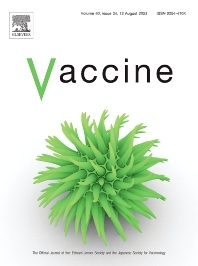 Vaccine has an open access mirror journal Vaccine: X, sharing the same aims and scope, editorial team, submission system and rigorous peer review. Vaccine is unique in publishing the highest quality science across all disciplines relevant to the field of vaccinology - all original article submissions across basic and clinical research, vaccine manufacturing, history, public policy, behavioral science and ethics, social sciences, safety, and many other related areas are welcomed. Our submission categoriesindicate where we receive the most papers. Papers outside these major areas are also welcome and authors are encouraged to contact us with specific questions. We also invite authors to submit relevant basic science and clinical reviews, methodological articles, opinion and commentary pieces, visual pieces, and letters. Authors are required to consult the Guide for Authors as this is a dynamic set of submission guidelines and is therefore subject to change. The Editors retain the right to desk reject submissions without peer review where it is clear that the Guide for Authors and the submission categories have not been consulted.